Setting up an antenna for broadcast TV over the air can be difficult if the TV signals are weak in your area. Today I’m going to explain how to boost antenna performance, get more channels, and improve reception on your indoor TV antenna. The signal encounters noise on its way from the tower. Any obstacles or interference between the tower sending the signal and the antenna receiving it is noise subtracted from the noise margin. If the noise margin is greater than 0, it can be received by a television tuner to display the channel on your TV set. However, there is also noise in the line between the antenna and the TV tuner. This noise is caused by the coaxial cable, signal splitters, and the tuner receiving the signal. Any component between the antenna and the receiver has the potential to generate noise. If the noise is too great, it can lead to a negative noise margin and no reception. Before deciding how to position your TV antenna there are 2 pieces of information you will need. First, which channels have a positive noise margin at my location? Second, in which direction are the towers generating the signal? 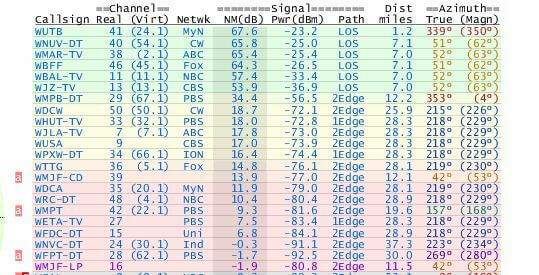 Using this signal analysis tool from TVFool.com will give you the table below. It shows the noise margin (NM) and direction in degrees (“Magn” under Azimuth). I’ve also put together an episode of the Grounded Reason Podcasts that walks you through using TV fool. There is also a bull’s-eye circular chart that shows the direction of the signal towers if you lack a compass. Many smart phones have a compass app either installed or available for free download. If all the channels of interest are in the same direction, then you may want to consider a directional antenna. A directional antenna receives signals from one direction as opposed from an omnidirectional antenna which can receive signals from multiple directions. 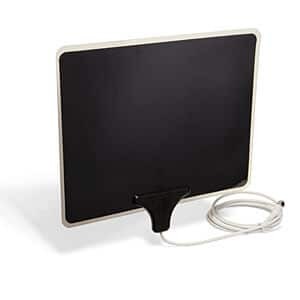 The benefit of a directional antenna is a higher TV antenna “gain” than omnidirectional TV antennas. This gain (also in dB) is added to the noise margin, counteracting some of the noise loss. This is different than gain from an amplifier, which will be addressed later. Essentially, the more directed an antenna, the higher the TV antenna gain. The obvious drawback to a directional antenna is the need to re-point the antenna when switching the channel to a tower in another direction. If all the towers are in the same direction, then this isn’t an issue. For more information on directional or omnidirectional antennas please see this antenna guide. Typically TV signal towers are tall enough to ignore most of the buildings and trees in the way of the path to a TV antenna. However a tree or building close enough to shadow your house and in the path of the signal will present a signal loss. Generally, if you can look up at a 45 degree angle in the direction of the tower and see sky then there shouldn’t be an obstacle subtracting from the noise margin. A building in the way has shown to present a loss of 10-21 dB in various studies. If your antenna is in the shadow of a building, then angling the antenna toward the roof of that building will minimize noise loss. Trees are another major noise contributor. This study on attenuation due to different types of trees from the University of Texas, gives an average UHF signal loss between 10-14 dB. This could be as high as 18.4 depending on the type of tree. Once antenna gain (if any) and obstacles are accounted for, subtract 10 dB to account for inclement weather and various sources not covered. There are too many noise potentials to list in this article and a noise buffer is wise to ensure reception in non-ideal conditions. If the noise margin is above 35 dB after subtracting noise estimates, then this house is a candidate for an indoor TV antenna. There are losses associated with passing through the exterior walls or roof. The ideal spot for an indoor TV antenna is in front of a non-metal window with no screen. A loss of 2 dB may be assumed in this ideal situation. Otherwise an exterior wall can present an average of 10-15 dB loss to the signal, which is subtracted from the noise margin. However, it is possible for this loss to be has high as 40 dB depending on the construction. For more information on the attenuation due to noise and obstacles check out this reference. If there is enough noise margin left once the antenna receives the signal, we want examine the line to the television. This signal loss is due to splitters, the coaxial cord and the TV tuner among others. The standard RG-6 coaxial cable presents a loss 5.65 dB per 100 feet of cable. There are more efficient, more expensive coaxial cables for indoor TV antenna installs if required. Wikipedia provides a great reference on coaxial attenuation. Splitters also present losses to the noise margin. It doesn’t matter if the split is done with 1 or more splitters. The loss to subtract from the noise margin is the number of final outputs multiplied by 3.5dB. Even if an output isn’t used, it still counts as noise. For this reason, it is best to only split the signal as needed. The connections from the antenna and tuner measure a loss of 1 dB. The TV tuner also adds noise. If the information isn’t available in your TV tuner or televisions owner’s manual, a loss of 8 dB should be assumed. In most indoor TV antenna installs, a preamplifier can be used. This device should be installed before any splitters. It adds gain to the signal received by the antenna to compensate from noise between the antenna and TV. Unlike the gain provided from directing the TV antenna, this device will not be able to increase the noise margin beyond what is initially received by the TV antenna. There is a loss to the noise margin associated with an amplifier. Since this loss is less than the loss generated by the TV tuner it makes sense to use an amplifier in many cases. For instance a TV tuner with a loss of 8 dB, and a 2–way splitter would amount to an 11.5 dB loss (8 + 3.5db for the splitter). Add a loss of 2.9 dB for an assumed 50 feet RG-6 coaxial cable, and then a 1 more dB loss due to the connection on either end brings the total loss to 15.4 dB. If a 15 dB gain amplifier were added to the line just after the antenna, then the loss would be only .4 dB. However the amplifier also carries noise. Let’s assume 3 dB bringing the total noise loss of the line to 3.4 dB. However, if a 20 dB gain amplifier with the same level of noise was added it would not add 1.6 dB to the margin. It would simply cancel the loss added by the line to the TV ensuring the signal strength is unimpeded from the antenna to the television. In other words, a pre-amplifier will not help a TV antenna pick up a signal already under the noise margin. There are situations when an amplifier is not necessary or even detrimental. If all the stations you want to receive hit the antenna with at least 30 dB of noise margin and there is only 3 dB lost in the line, then there is no need to amplify. All the stations can already be received. Furthermore, if a signal is over amplified it could cause the tuner to not receive the station. I hope this was helpful. If there are any questions, please leave them in the comments.